In all of the excitement of the holiday season and new year, I neglected to give adequate coverage of the predictions that Ripple is making for the coming year. Yes, I've provided my insights and predictions over the last two weeks, and I've covered all sorts of recent news and events, along with XRP adoption news and strategies. Each of these posts was done with a certain amount of research and interaction with the crypto community, but it's important to stop and realize that Ripple has a well-spoken public relations department as well; in addition to this, some Ripple executives blog and do interviews separately from the company. 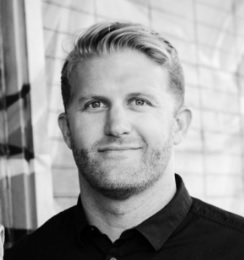 This realization - that I hadn't yet read enough of the recent material from Ripple employees - came when I stumbled upon a blog post from Stefan Thomas on Coindesk. It was an exclusive contribution to Coindesk, and he talked about ICOs, blockchain technology trends, and the potential impacts to XRP. At that point, I thought it might be a good idea for me to pause and review some of Ripple's perspective(s) on different topics that might impact 2018. This statement is from the Chief Cryptographer at Ripple, so I am taking this comment from Warren Paul Anderson as fact at this point - decentralization will soon be a bragging point for XRP compared to Bitcoin and Ethereum - not exactly what some of the Tweeters in crypto would have everybody believe! 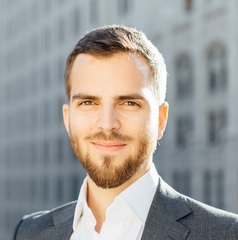 Just so readers understand; Stefan Thomas is the Chief Technical Officer (CTO) at Ripple, and he also co-created ILP - the Interledger Protocol. On December 26th, he wrote an article for Coindesk in which he provided five predictions for 2018.3 Because of his position, and the importance of his comments regarding Ripple's overall technology strategy, we should take a look at what he said. What are Stefan Thomas's predictions? While the first one is nothing new for those that follow Ripple, it's a bold move to say that 2018 will contain the "death of the ICO token." I don't doubt that he could be right, but I think that ICOs will be around next year at this time, unfortunately. "If speculators entered the digital asset market in droves last year, 2018 will be the year that major institutional players like asset managers, pension funds and other financial institutions, such as payment providers, enter the space. We’re already seeing increased over-the-counter (OTC) trading of digital assets, such as bitcoin on the Chicago Board Options Exchange (CBOE), causing liquidity across the market to deepen. It’s really a matter of when, not if, listings of additional cryptocurrency futures on OTC exchanges will take place. My bet? We’ll see the listings by next summer." Here are three predictions, all startling, and all indicating how Ripple sees the pieces on the chessboard. First off, Ripple believes that traditional fund managers will be trying on crypto for size. Pension funds are notoriously conservative, but if they dip their toes into crypto to sample its triple-digit or even quadruple-digit returns, we're talking about a LOT of money. How much money is involved in pension funds? Let's say one percent of these assets end up being invested in blockchain-based technology or crypto-currencies. How much money would that translate to? (20 trillion + 40 trillion) / 100 = .6 trillion, or $600 billion. Do you think the various funds will stop at 1% in 2018, or do you think some of them will opt for greater percentages of their portfolio? If greater, then you must anticipate an even bigger impact to the crypto markets. What that looks like and how it plays out is subject to speculation, but you can be sure that finance on that scale will necessarily involve new reporting standards for funds and government oversight. The main point here is that Stefan Thomas is talking about Ripple and its competition. The interesting quote? A comparison with Ethereum's Raiden. "Raiden, the ethereum interoperability solution for ERC-20 tokens, launched its token in September, while the Interledger Protocol (ILP) was used to connect seven ledgers including bitcoin, ethereum and XRP in June. My money is (unsurprisingly) on Interledger. If all networks were to become ILP-enabled, it ultimately wouldn't matter if you held bitcoin, ether, litecoin or XRP. ILP would allow you to make payments to a merchant that only accepts bitcoin, for example, using XRP — all in just a matter of seconds." ILP-enablement is one feature that banks will cherish, IMO, and Stefan Thomas does an exceptional job of pointing out in the last paragraph just what is possible for crypto end-users using the international standard that Ripple championed with the W3C. "Until now we’ve seen a proliferation of both public blockchains like bitcoin and private blockchains like Hyperledger Fabric. Going forward, I think we’ll start to see the rise of hybrid blockchains, which combine the best of both worlds. A hybrid blockchain runs on the open internet and is accessible to anyone like a public blockchain, but it uses a smaller set of validators and is more targeted towards a specific use case like a private blockchain." "Deploying an ethereum contract or creating an ERC-20 token will be replaced by launching your own mini-blockchain, which can be tuned to the exact needs of a given project. 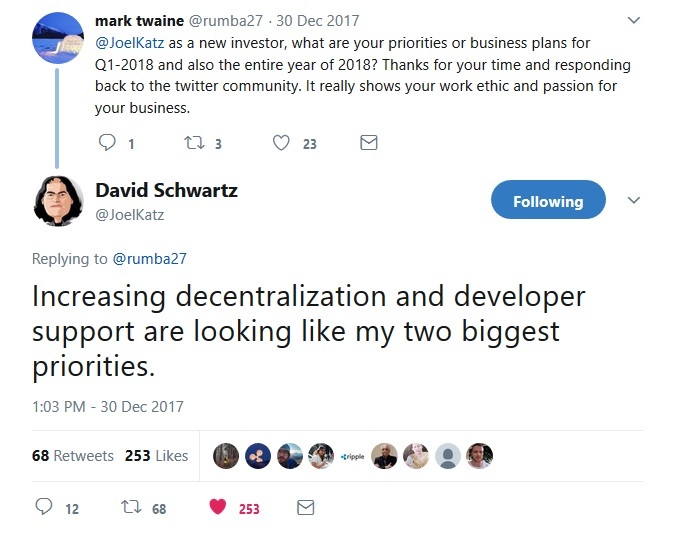 Need more decentralization? Less? More powerful functionality? Should it be upgraded frequently or remain very stable? One size doesn't fit all, but next year you'll finally be able to choose." A mention of BigchainDB - Intriguing! Specialization or Generalization - a Contradiction? Stefan Thomas also called for the use of digital assets such as XRP that already command a large chunk of liquidity, rather than the use of specialized tokens that will merely have to be traded by their owners for a more liquid crypto-currency. "Over the course of this article, I've argued that general-purpose tokens will replace special-purpose tokens and I've also said that special-purpose blockchains will replace general-purpose blockchains. This might seem like a contradiction at first, but as blockchains become more interoperable, blockchains and tokens will simply be less coupled together." These predictions have some wide-ranging implications for 2018, and to get a feel for how this plays out in the media and in the retail investment space, it's probably a correct approach to overlay his predictions with a timeline and then chart other developments in the blockchain space along the same path. This will give us an interesting picture of one high-probability scenario for XRP and its market in 2018. One of Brad's first interviews of 2018 was on the "Bad Crypto Podcast" on January 3rd, 2018. 9 The interviewers peppered him with a multitude of questions, including several that touched on some points that will eventually impact 2018 for XRP. If Ripple is successful at what we're doing, that's really about what we're doing; we're enabling an Internet of value: Enabling value to move the way that information moves today. It's a big deal - it would fundamentally change the way that commerce works." 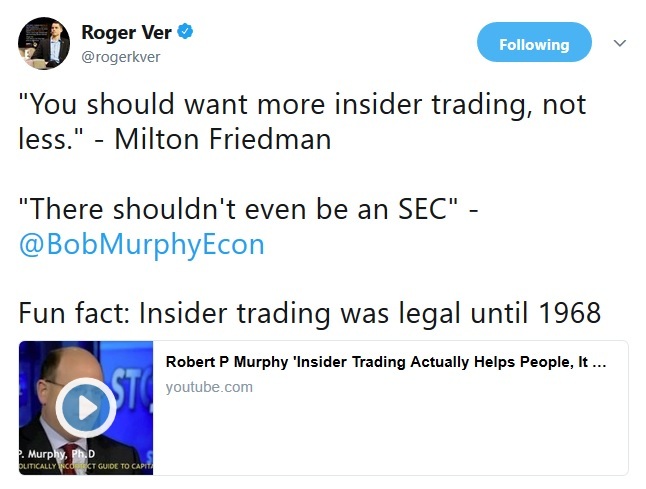 "Roger has obviously had a huge contribution on a macro level, but I think examples like this are actually destructive to the progress we're trying to make. And when I say 'we' I'm not talking about Ripple; I'm talking about 'we, the blockchain community' - or 'we in the crypto community'. Governments aren't going to go away. Regulations aren't going to go away. They're there for a reason." "use cases we haven't even broached yet"
This was a validation for me, since I've been impatiently waiting to hear about Ripple targeting some of these additional use cases. It also merges with Stefan Thomas's comments as well, so it indicates that the goal to target micropayment is certainly a company-wide and consistent strategy. The only question is 'when?' in 2018? While the community has wasted no time in creating applications for social media that utilize XRP, micropayments at a global scale would be a great addition to the overall liquidity of the network. 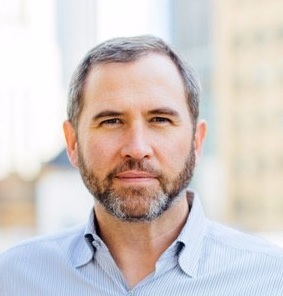 It was a breath of fresh air to hear Brad Garlinghouse remind the interviewer of the quarterly XRP Markets Report, as I believe that this level - and possibly additional levels - of accountability for XRP supply management will be needed to satiate the crypto markets' demand for information. I foresee Ripple using the XRP Markets Report as a standard way of announcing progress and partnerships; they will need to standardize their approach for these announcements as 2018 marches forward. At one point, an interviewer asked Brad if he sees Ripple being used for retail use cases for vendors. He indicated that consumers in the crypto space now would like to use whatever token they own to do transactions, and could Ripple be used to help streamline this process. "Of course I think about use cases that go beyond the institutional 'stuff' that Ripple the company is doing." Replacement of Nostro account holdings is one of the use cases for XRP, and it's potentially massive in its own right, above and beyond the utility-driven demand of using XRP as a bridge currency. Will Banks Create Their Own Coins? No. The problem with a bank-issued coin is that it's by definition a counter-party asset that requires one organization to trust the ability of the issuing organization to redeem the token. While the interview wasn't specifically about 2018, the interviewer asked Brad about many of the hot topics where rumors have been circulating: the "household names" that will be part of xRapid, and the possible Coinbase listing. 15 16 Brad was careful to skirt both of these points, however, so he's keeping his cards close to his chest. "It wouldn’t surprise us if we see a proliferation of lawsuits, fines, and even jail time for some. We expect this will drive significant volatility in the crypto space, but only in the short term." "Those that are nothing more than an experiment will scramble to find them. CryptoKitties is just one example of what we’ll see more and more over the next few months — half-baked attempts to find a use case for coins that never had a purpose to begin with." This is the fourth example in a week where I've seen Ripple calling out Ethereum. What this indicates to me is that Ripple is adding to Codius in a very major way, with plans to upgrade its capabilities and take over smart contracts. As an early investor with limited data, you have to read between the lines to see a corporate strategy developing. The Ripple team mentioned that "interoperability" will be a critical differentiating factor between what the market needs, and which digital asset can supply it. This is great news, since interoperability is one of Ripple's strong points, and they've made all the right moves to supply organizations with this trait. With different sources and comments, we can predict a few things about Ripple's path through 2018. If you look at this list, it's possible to chart out some probable scenarios for what specific points in 2018 might look like. These points as communicated by Ripple are exactly what needed to be said at this point in time, and I believe that these statements are somewhat conservative. One thing that Ripple's statements do not consider is the massive impact that SBI might have on crypto, and on XRP. I've blogged about how SBI's plans might have a massive parallel impact on XRP adoption in Asia - both by retail investors and by banks who are planning on using XRP for liquidity. That comment from the CEO of SBI Holdings is quite illuminating, and reveals his very personal motivation to make sure that XRP is the premier digital asset used by banks and financial institutions. Negative Impacts from XRP Appreciation and Price Movement? As XRP starts to challenge Bitcoin's dominance, expect it to come at a price for Ripple. Mainstream press will want to talk to individuals connected to Ripple's founding that may be facing a listing on the "world's richest entrepreneurs" edition of some online magazines. In addition to unwanted personal attention, mainstream press will also be highlighting criticisms of Ripple and XRP as it starts to be recognized at an increasing level. This means that Ripple should organize itself to respond to social media. Quickly. In the XRP Investor community, we've already noticed an influx of crypto-related tweets and other social media posts critical of XRP. While some in the crypto social media were content to ignore XRP, its latest challenge to Bitcoin has prompted some with a big financial stake in Bitcoin to take shots at XRP and Ripple. My guess is that some percentage of these latest online posts are "one-time" occurrences as people start to grow accustomed to the thought of XRP replacing Bitcoin on most exchanges for the default fiat-crypto value pairings. I expect the market to adjust, but not before many volleys have been fired at Ripple and XRP. Ripple should anticipate such an occurrence and be prepared to respond with promptness and assertiveness. So far, they've been doing a great job, but the number of these interactions may quickly outpace their bandwidth! Unlike other crypto-currencies, XRP investors can rest easy knowing that Ripple is doing the hard work to speed adoption and grow its market share in 2018. There's many points along the way that XRP holders have to look forward to, from multiple xRapid partnership announcements, to SBI's execution of its business plans. Will XRP demand explode with xRapid adoption? Community members are currently analyzing several possibilities about how utility-driven demand could supercharge the valuation of XRP. Do you agree with Ripple's analysis of the crypto market, and their focus for 2018? I've made my opinion clear; not only do I think that Ripple's evaluation of the market is precise and accurate, I believe that XRP appreciation is going to stun traditional and crypto markets for years to come.